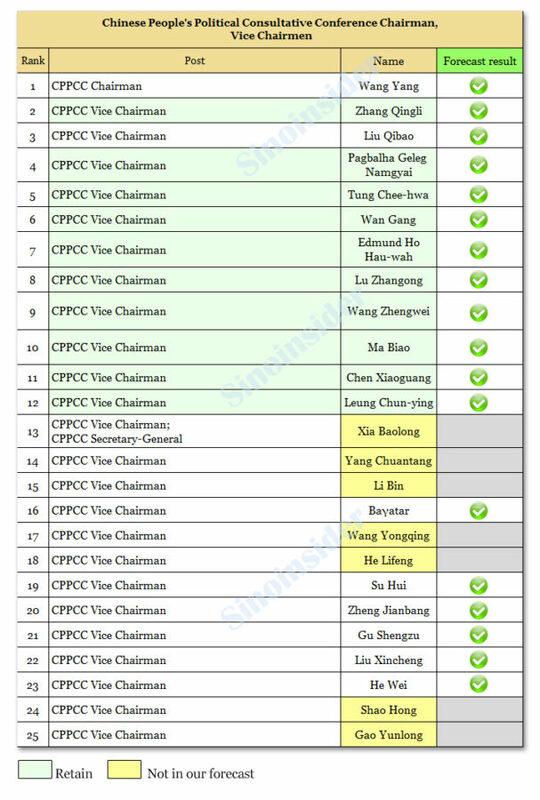 ◎ We scored 18 out of 25 for our CPPCC Two Sessions personnel forecast. The 13th Chinese People’s Political Consultative Conference (CPPCC) elected its chairman and other key personnel during its fourth plenary session on March 14. As we anticipated in our 19th Party Congress predictions, Politburo Standing Committee member Wang Yang became the new CPPCC chairman, replacing Yu Zhengsheng. Of the 24 newly elected vice chairs, 10 are serving a second term. We scored 18 out of 25 (72 percent accuracy) for our CPPCC Two Sessions personnel forecast. 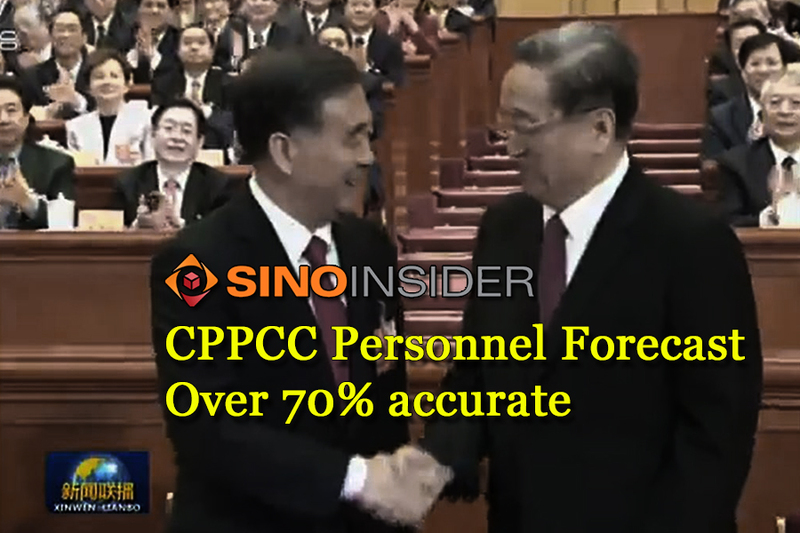 Ten of the 17 we picked previously served as CPPCC vice chairs. 1. SinoInsider is the only group that has produced a list of 118 potential key appointees for the Two Sessions, the second most important mass political reshuffle after the 19th Congress. 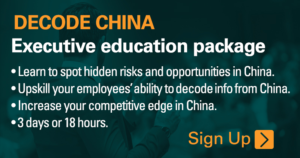 We have the confidence to forecast key personnel movement in China because we have a unique research methodology that allows us to make predictions with a very high degree of accuracy. Our research methodology also allows us to accurately assess political risk on the mainland. 2. The political rules changed in China after Xi Jinping became CCP General Secretary in 2012. Over 1.5 millions Chinese officials have been purged under Xi’s anti-corruption campaign, including “untouchables” like Bo Xilai and Zhou Yongkang. Big multinationals were suddenly handed massive fines, including companies like Microsoft who have been in China for decades and have good relations with the Party’s elite. Also, Sino-U.S. relations took on a new dimension after Donald Trump won the U.S. presidential elections in 2016. Trump has irked China by being friendly with Taiwan and getting tough on trade issues and intellectual property theft. Yet Trump the China hawk is on excellent terms with Xi, while Mike Pompeo, his Secretary of State-designate, remarked that Xi has “incredible capacity to do good around the world” when he fully consolidates power. 3. China’s economic issues are political issues, and political issues are linked with CCP factional struggle (neidou). The political “fog of war” is particularly risky for businesses in China, and missteps can be costly. Companies that factor in political risk, however, stand to avoid losing big: After seeking out our experts for advice, a big Taiwanese company decided against investing in a province on the mainland, and saved tens of millions after the political winds shifted in the province. 4. Our political situation advisory services can help companies in China sidestep risks and seize business opportunities.